Black Box, a leading maker of pro AV cables and equipment, has unveiled active optical cables that can extend DisplayPort 1.4 or HDMI 2.0 signals for more than 0 meters. The maximum bandwidth supported by the DP cables is 32.4 Gbps and the maximum resolution they support is 7680×4320 at 60 Hz. The new Black Box active optical cables use a 0.48-mm fiber optic design with triple shielding against EMI and RFI. The hot-swappable cables can be bent, which is important in situations when cables are used over long distances and inevitably have to go through tight spaces and around the corners. Besides fiber, the cables also include a copper wire that pulls power from the source and therefore does not require any external power. The new active optical cables from Black Box fully support DisplayPort 1.4 or HDMI 2.0 protocols as well as all types of surround sound that these technologies support, including PCM 8-channel, DTS-HD, and Dolby Digital True HD. In case of DP 1.4, the cables support bandwidth of up 32.4 Gbps as well as the maximum resolution of up to 7680×4320 at 60 Hz. In case of HDMI 2.0, the cables transfer up to 18 Gbps and thus support resolutions up to 4096×2160 at 60 Hz with 4:4:4 chroma subsampling. Black Box plans to offer its new cables in standard lengths of 10, 15, and 30 meters (packed in boxes) and 50 or 100 meters (supplied on spools). Multiple cables can be used to transfer video streams over distances of up to 0 meters. 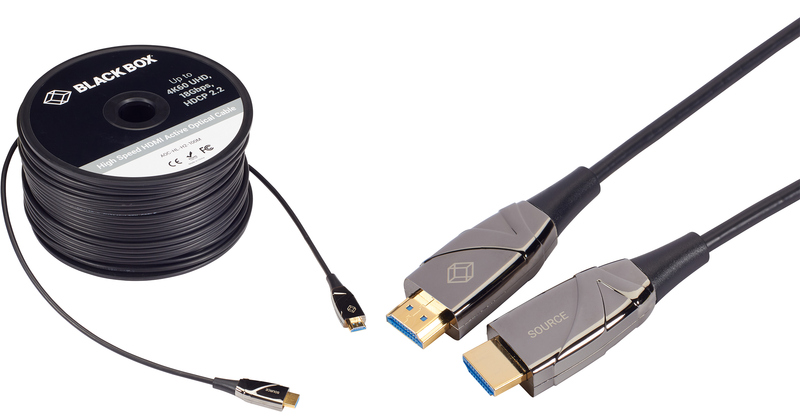 Black Box already offers its active optical DP 1.4 and HDMI 2.0 cables on its web site. A 100-meter DP 1.4 spool costs $899.99, whereas a 100-meter HDMI 2.0 cable is priced at $699.99.